Includes one (1) set of window clings. Available in three (3) different styles: bloody drips (includes 1 piece), blood splatters (includes 3 pieces), and bloody hand prints (includes 2 pieces). Colored as pictured. These bloody window clings are designed to work on windows and mirrors only. 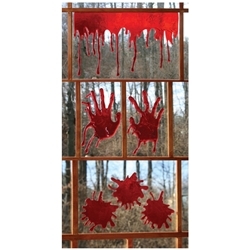 Great for Halloween decorations and adding some bloody effects to your haunted house.